Contrary to popular belief, today’s snowmobiles actually have a surprisingly small impact on our environment. Most of the ground, water and vegetation that snowmobiles travel over is frozen and protected by a layer of snow. Snowmobile manufacturers spend millions of dollars designing and engineering their snowmobiles to stay on top of that snow, and as a result most modern snowmobiles actually exert less pressure on the ground than a person walking. To further reduce environmental impact, the Klondike Snowmobile Association encourages all of our members to make use of pre-existing trails whenever possible, and to avoid any areas designated as environmentally sensitive. In recent years snowmobile manufacturers have also made significant improvements in the air quality department. Almost all snowmobiles currently in production make use of on board computers and either four stroke engines or direct-injection two stroke engines, both of which are much cleaner and more efficient than traditional two-stroke snowmobile engines. Leave tracks not trash. If you had room to bring it in, you have room to bring it out. Respect all wildlife. Animals are more vulnerable during winter, please respect their habitat, give them lots of space, and reduce your noise levels as much as possible. Respect the land. Use pre-existing trails when available, and avoid any areas that have been designated as environmentally sensitive. Embrace new technologies. Modern snowmobiles run much cleaner and more efficient than those from the past. In addition to environmental benefits, they also offer better performance while saving you money on fuel and oil! Maintain your sled. A well tuned snowmobile will be more reliable, easier on the environment, and perform better. Be a responsible snowmobiler. Respect wildlife and our environment, learn and use safe riding techniques, and be nice to other user groups. Join your local snowmobile club. They work hard for you, and they are often a great source of riding tips and other useful information. Spread the word! Snowmobiles have improved immensely over the last few years, and their environmental impact is actually surprisingly small. January is… National Snowmobiling Environment Month! The Species At Risk Act is a major step forward in protecting our environment and the Canadian Council of snowmobile Organizations (CCSO) supports the general intent of this Act. Our goal is to be actively involved in protecting and preserving Canada’s natural treasures including species at risk. 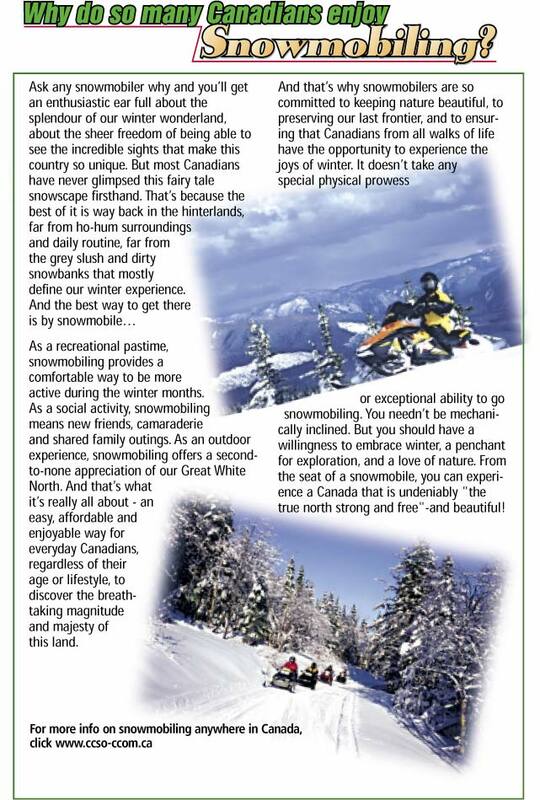 Snowmobiling offers a unique winter experience and connection to nature. An environment that is not seen is not enjoyed. Out of sight is out of mind and leads to the public losing their sense of ownership. An environment that people do not share a sense of ownership in loses its importance for everyone. Snowmobilers are committed to the environment as active participants. In surveys, snowmobilers consistently rank “being one with nature” and “viewing the scenery” as some of the most compelling reasons to be outdoors in winter and that’s why, both individually and as a group, we are so attuned to respecting our environment and keeping nature beautiful. Snowmobile clubs have been active stewards of the Canadian environment for decades, investing time and money in preserving our natural heritage. The snowmobile community has invested millions of dollars in expense, labour and time developing trail networks in every province and territory, and many of them have also been very active in building and promoting the Trans Canada Trail. Canadian Council of Snowmobile Organizations members are committed to working with government ministries and agencies to build and maintain trails that meet or exceed all applicable environmental specifications and regulations, avoid environmentally sensitive areas, protect waterways, and respect nature. Properly managed snowmobiling has very little impact on the environment. Multiple studies demonstrate the low impact of snowmobiling on many species. In point of fact, for some species of plants and animals humans on foot can actually have a greater impact than humans on snowmobiles. There is also evidence that the creation of trails can benefit large animals especially in times of deep or drifted snow. Most of today’s organized snowmobiling occurs in designated areas and on defined and organized trails, which comprise a comparatively small footprint compared to the overall Canadian land mass. Moreover, snowmobiling only occurs during the winter when the earth is protected by a blanket of snow and ice, mitigating impact on plants and earth. When winter is over and the snow melts and our snowmobiles are put away, most snowmobiling areas return completely unharmed to their natural state.